Tribes of Chippewa and Sioux had encampments on nearby Medicine Lake. The first white settlers arrived in the early 1850s. Golden Valley was incorporated December 17, 1886. In the early twentieth century, it was mostly a farming community. According to the United States Census Bureau, the city has a total area of 10.55 square miles (27.32 km2), of which 10.20 square miles (26.42 km2) is land and 0.35 square miles (0.91 km2) is water. The 45th parallel north runs through Golden Valley, coinciding approximately with Duluth Street. Interstate 394, U.S. Highway 169, and Minnesota State Highways 55 and 100 are four of the main routes in the area. The Breck School, a private Episcopal school. Most children who live in Golden Valley attend the Robbinsdale School District or the Hopkins School District, as all of the territory of the city belongs to one or the other school district. Some students attend public schools in other school districts chosen by their families under Minnesota's open enrollment statute. General Mills' expansive corporate campus in Golden Valley. Even though the population of Golden Valley is around 20,000, more than 30,000 people work in Golden Valley. This is because of the presence of large employers including General Mills, Honeywell, and Pentair. As of the census of 2010, there were 20,371 people, 8,816 households, and 5,417 families residing in the city. The population density was 1,997.2 inhabitants per square mile (771.1/km2). There were 9,349 housing units at an average density of 916.6 per square mile (353.9/km2). The racial makeup of the city was 85.4% White, 7.1% African American, 0.4% Native American, 3.5% Asian, 0.9% from other races, and 2.7% from two or more races. Hispanic or Latino of any race were 2.6% of the population. There were 8,816 households of which 25.6% had children under the age of 18 living with them, 50.3% were married couples living together, 8.1% had a female householder with no husband present, 3.1% had a male householder with no wife present, and 38.6% were non-families. 30.4% of all households were made up of individuals and 14.5% had someone living alone who was 65 years of age or older. The average household size was 2.26 and the average family size was 2.84. The median age in the city was 45.7 years. 19.9% of residents were under the age of 18; 5.1% were between the ages of 18 and 24; 23.7% were from 25 to 44; 30.9% were from 45 to 64; and 20.3% were 65 years of age or older. The gender makeup of the city was 48.6% male and 51.4% female. As of the census of 2000, there were 20,281 people, 8,449 households, and 5,508 families residing in the city. The population density was 1,982.3 people per square mile (765.4/km²). There were 8,589 housing units at an average density of 839.5 per square mile (324.2/km²). The racial makeup of the city was 91.07% White, 3.59% African American, 0.29% Native American, 2.87% Asian, 0.03% Pacific Islander, 0.55% from other races, and 1.61% from two or more races. Hispanic or Latino of any race were 1.76% of the population. There were 8,449 households out of which 26.5% had children under the age of 18 living with them, 55.5% were married couples living together, 7.5% had a female householder with no husband present, and 34.8% were non-families. 27.6% of all households were made up of individuals and 12.1% had someone living alone who was 65 years of age or older. The average household size was 2.31 and the average family size was 2.84. In the city, the population was spread out with 20.6% under the age of 18, 5.0% from 18 to 24, 28.2% from 25 to 44, 26.5% from 45 to 64, and 19.6% who were 65 years of age or older. The median age was 43 years. For every 100 females, there were 93.7 males. For every 100 females age 18 and over, there were 89.9 males. The median income for a household in the city was $62,063, and the median income for a family was $75,899 (these figures had risen to $77,976 and $87,828 respectively as of a 2007 estimate). Males had a median income of $49,890 versus $35,967 for females. The per capita income for the city was $34,094. About 0.8% of families and 3.0% of the population were below the poverty line, including 2.2% of those under age 18 and 3.6% of those age 65 or over. Golden Valley is a statutory city, where the Mayor votes with the City Council. Golden Valley operates under the council–manager form of government. The City Council sets the policy and overall direction for the city, and appoints a city manager to serve as administrator. The city manager directs city staff in carrying out council decisions and providing services. The Mayor serves a four-year term. There are four council members serving staggered four-year terms. Two council seats are up for election every two years, in odd-numbered years. The council members run citywide; there are no wards. The current Mayor is Shep Harris. The current City Council includes Joanie Clausen, Larry Fonnest, Steve Schmidgall and Gillian Rosenquist. 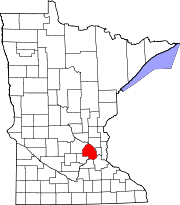 Golden Valley is located in Minnesota's 5th congressional district, represented in the U.S. House of Representatives by Minneapolis activist and organizer Ilhan Omar, a Democrat. The city is split between two state legislative districts: 46B, represented by Representative Peggy Flanagan and Senator Ron Latz, and 45B, represented by Representative Lyndon Carlson and Senator Ann Rest. All four are Democrats. Jordan Leopold – National Hockey League Member of U.S. Olympic hockey team and the NHL's Minnesota Wild. Aaron Sele – former Major League Baseball right-handed pitcher. ^ Golden Valley Historical Society (1986). Golden Valley: A History of a Minnesota City. pp. 3–4. ^ Upham, W. 190. Minnesota Geographic Names: Their Origin and Historic Significance. Minnesota Historical Society. ^ Golden Valley Historical Society (1986). Golden Valley: A History of a Minnesota City. p. 25. ^ "Sandburg Middle School - History". Sandburg Middle School. 2011. Retrieved 2011-07-27. ^ "Commercial Cleaning Company - Indoor & Outdoor - Tennant". ^ "General Mills: A U.S.-based food company. Our brands - such as Cheerios, Betty Crocker, Pillsbury, Haagen-Dazs and Cascadian Farm, to name a few - are enjoyed in more than 100 countries on six continents". ^ "Pentair - Global Leader in Water, Fluid, Thermal Mgmt & Equipment Protection". ^ "Best Lawn and Garden Tools - Garden Equipment from BlueStoneGarden". ^ (www.XTlab.com), Xpandable Technology Lab. "USFamily.Net Home Page". ^ "City of Golden Valley - About Golden Valley". ^ "U.S. Decennial Census". Census.gov. Retrieved May 28, 2013. ^ "Population Estimates". United States Census Bureau. Retrieved June 8, 2016. Golden Valley Historical Society (1986). Golden Valley: A History of a Minnesota City, 1886-1986. Golden Valley Historical Society. This page was last edited on 6 April 2019, at 21:18 (UTC).